Spring weddings at the Pelican Hill Resort in Newport Beach are luxurious and stunning. It is hard to get past the ocean views from the ceremony site under the rotunda. But once you do prepare to get swept away again by the gorgeous reception in the Mar Vista ballroom. 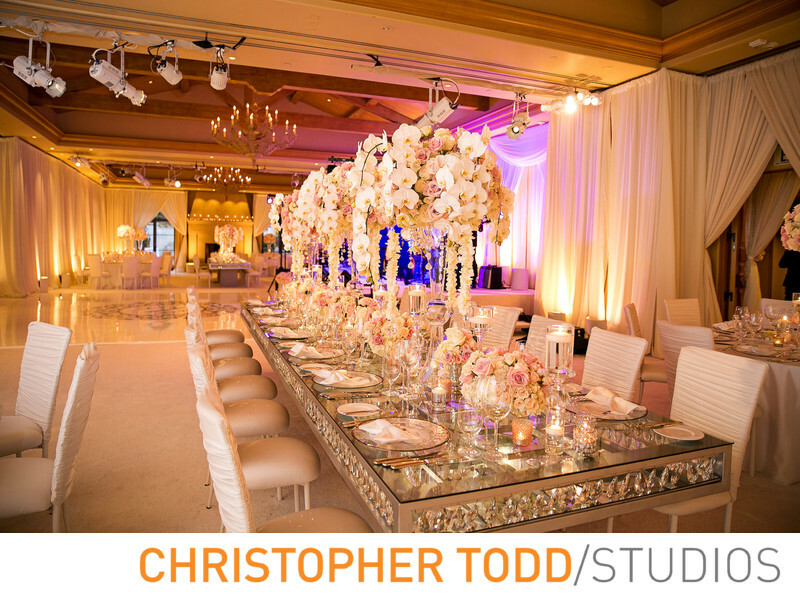 Transforming the Mar Vista Ballroom into the bride's fairy tale wedding was like a dream come true. White drapes and white carpet decorate the entire space. Accented with white dining chairs. Floral arrangements for centerpieces and a mirror table. The custom dance floor with the couples initials was one of a kind. 1/60; f/2.8; ISO 640; 24.0 mm.